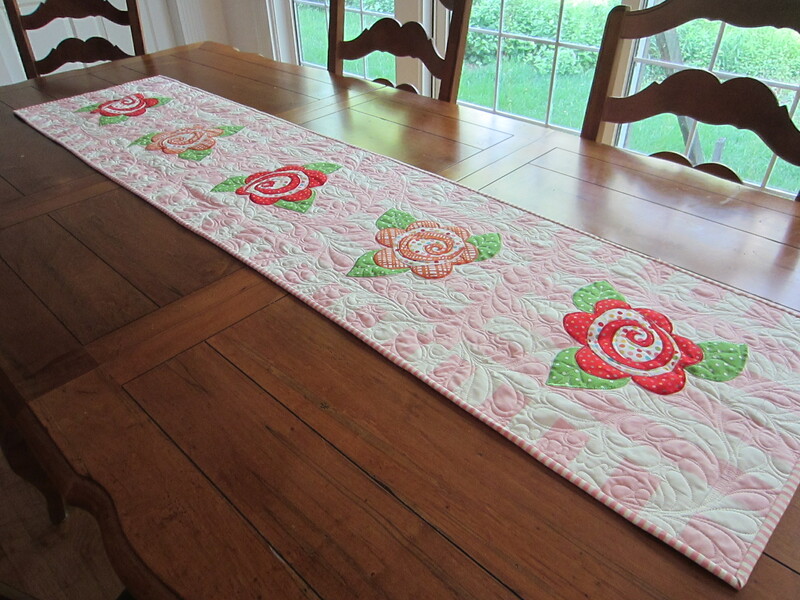 I recently finished this little runner for my kitchen table. It was supposed to be for February/Valentines Day. 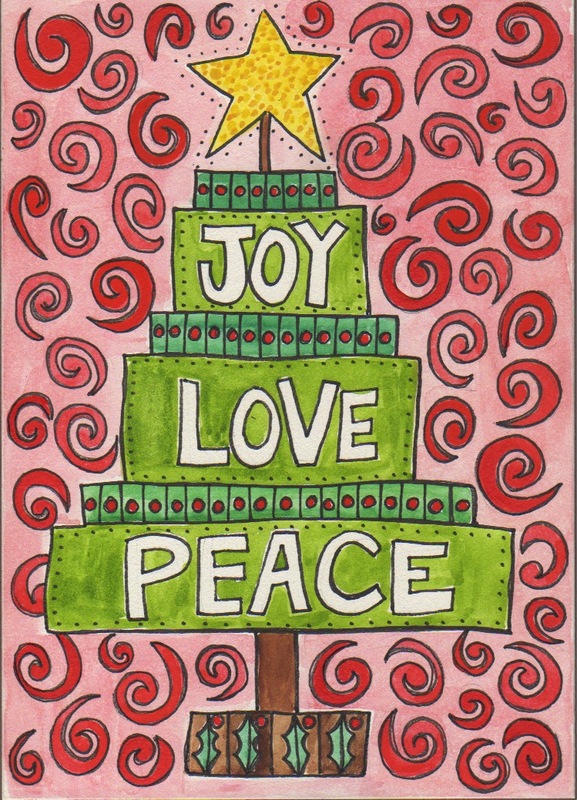 Well, yes, it is a few months late, but at least it is completed and not hanging around my sewing room any more! 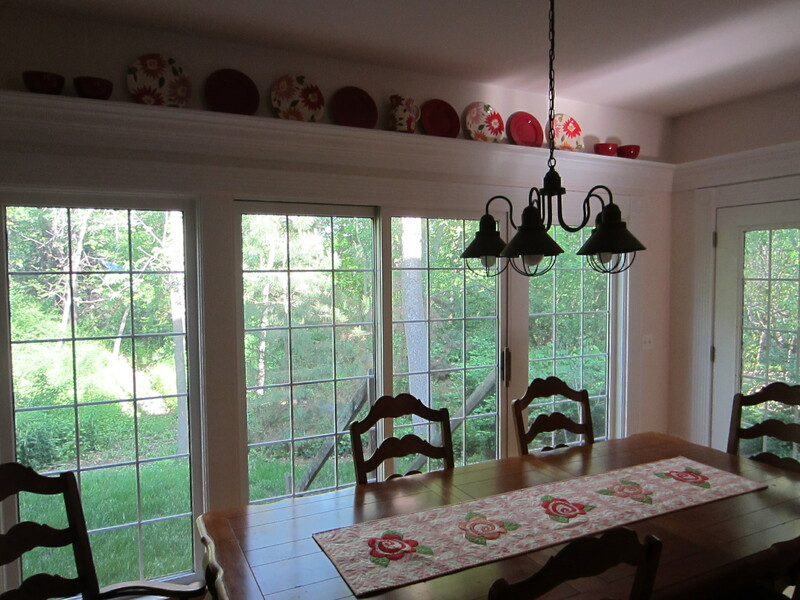 The pink, red and orange color scheme came from the dishes above the table. 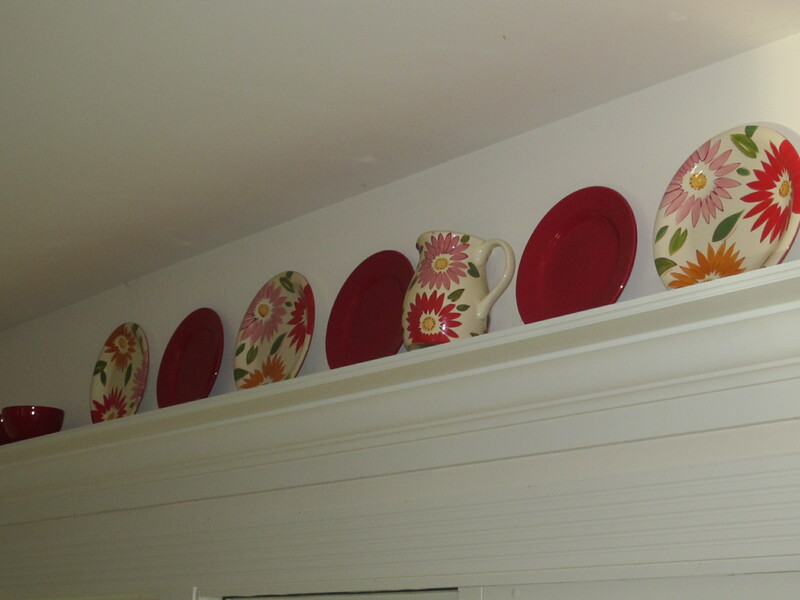 When we built our home several years ago, I just had to have a plate shelf. I designed the flower appliques. And I used fusible web to attach them and finished off the edges with a satin stitch. 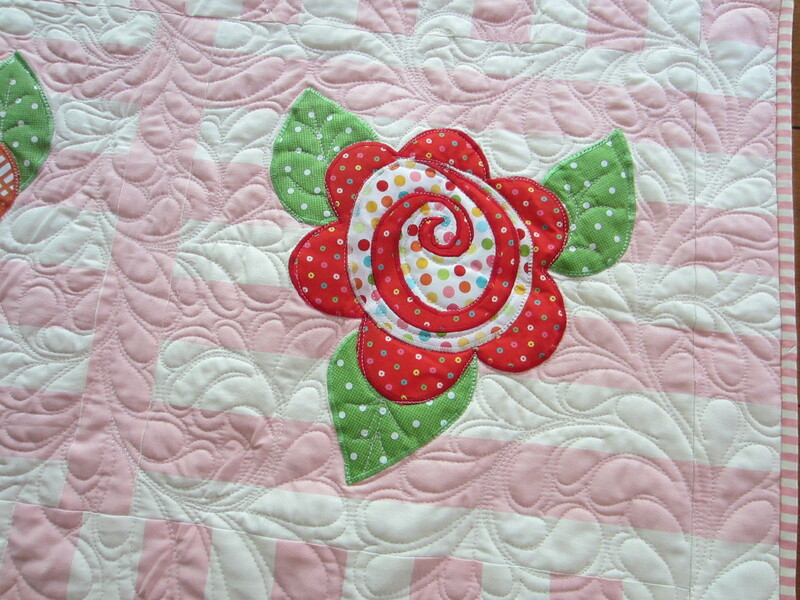 I did very little piecing for the background as the fabric was already printed with 1 inch stripes. 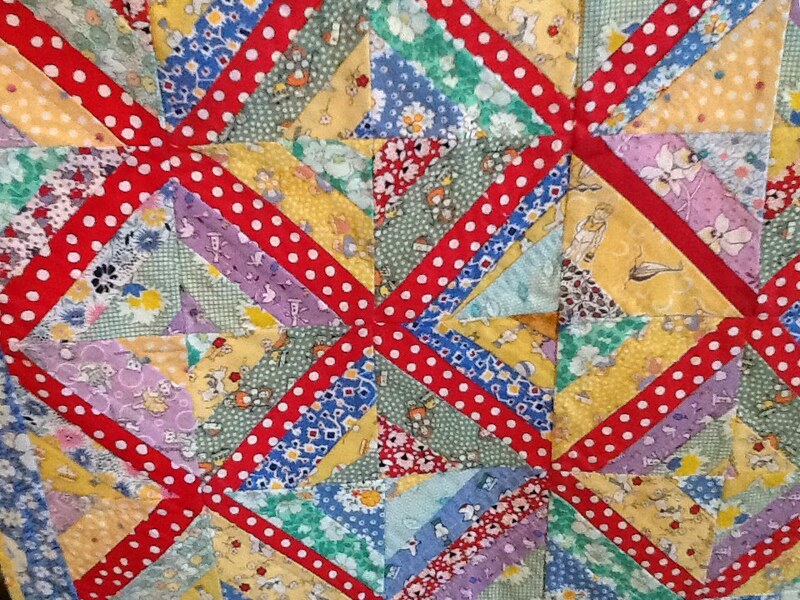 I finished it off by quilting around the flowers with my signature free-hand feathers. This was one of those “just for me” projects that I rarely get to. Unfortunately, I picked the wrong time of day to get a good picture, but you get the idea. Just for fun. 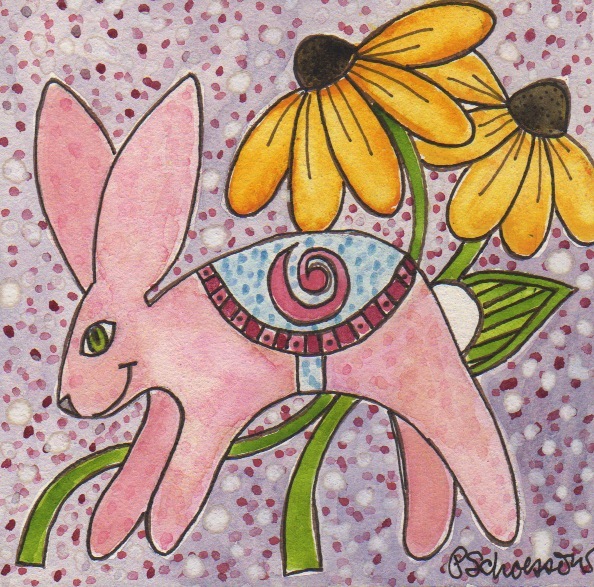 Spring bunnies will be arriving soon! 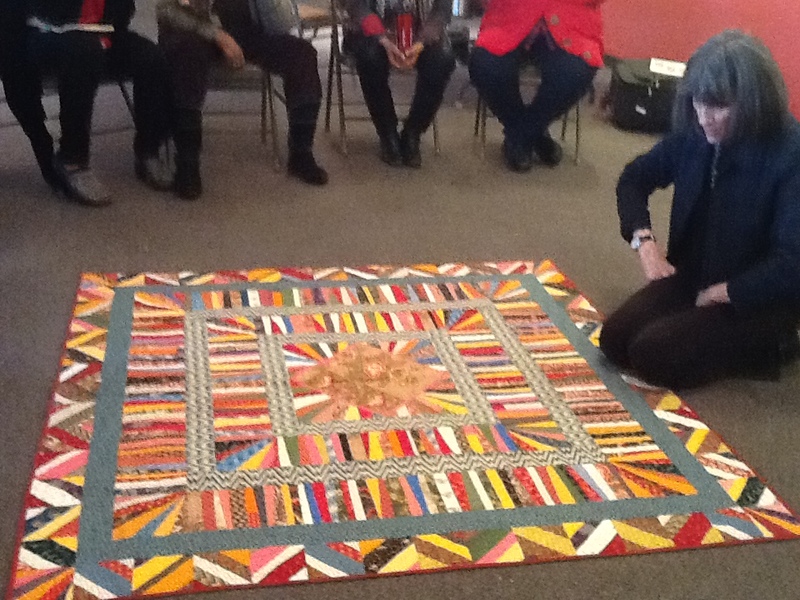 I’m really fortunate to belong to a quilt guild that brings in fabulous teachers from all around the country. This week was no exception. I had the great opportunity to attend a day long workshop with Gwen Marston. Even though Gwen has been teaching in this industry for 3 decades and has written 26 books, I was surprised to find her techniques to be quite fresh and modern. I think she has changed my life! 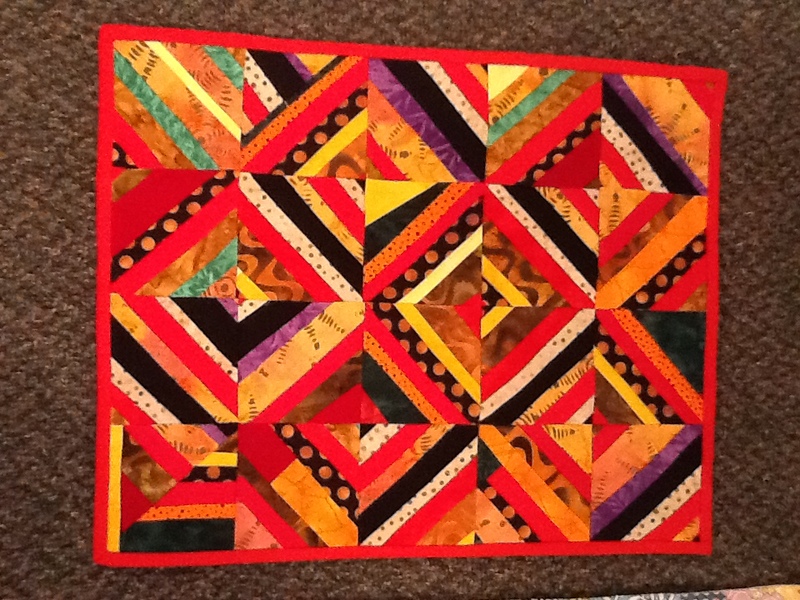 (well, my quilting life, anyway). 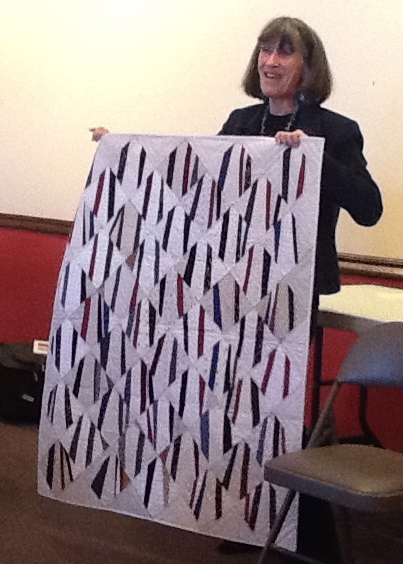 Her approach to improvisational piecing was truly liberating. Here are some of the pieces she shared with us. 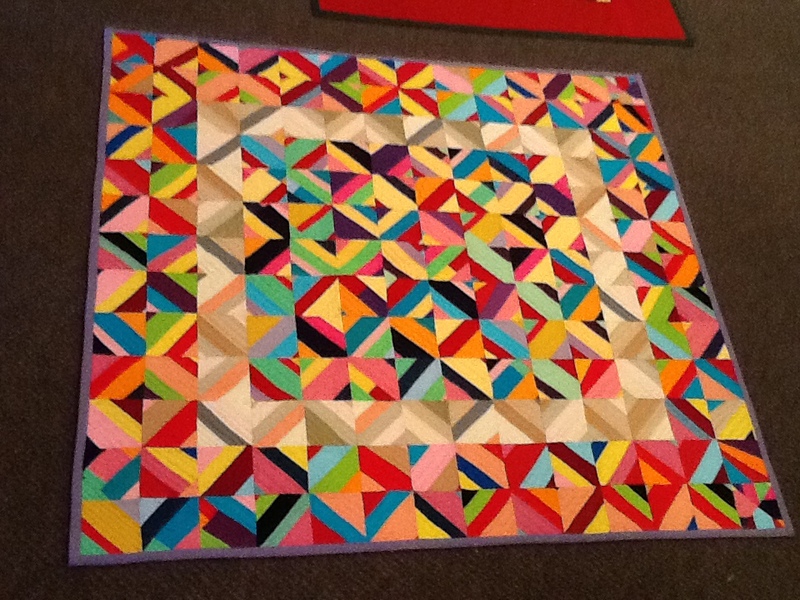 First, strip piecing with 30’s prints. Notice how everything doesn’t need to match up exactly. It’s OK! Those black fabrics really give this movement! It’s the use of solid colored fabrics that really give this a modern feel. 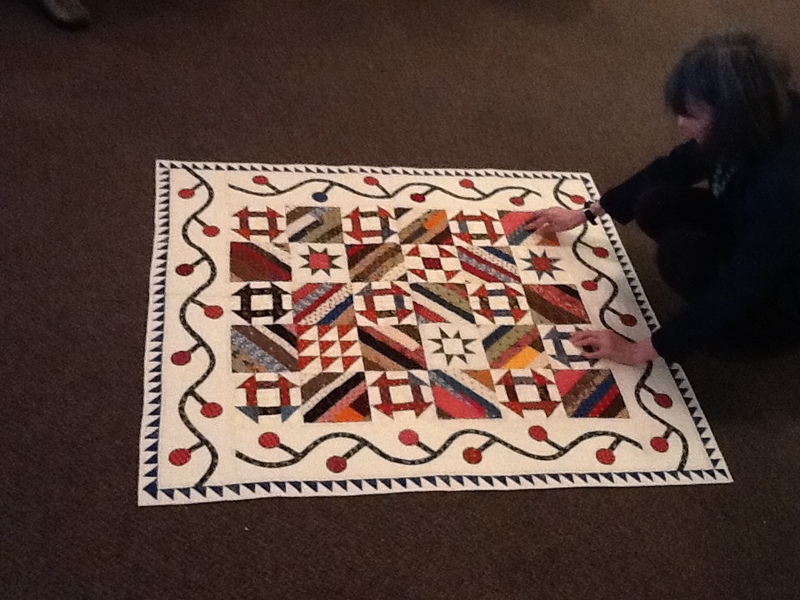 Gwen often takes her inspiration from antique quilts. 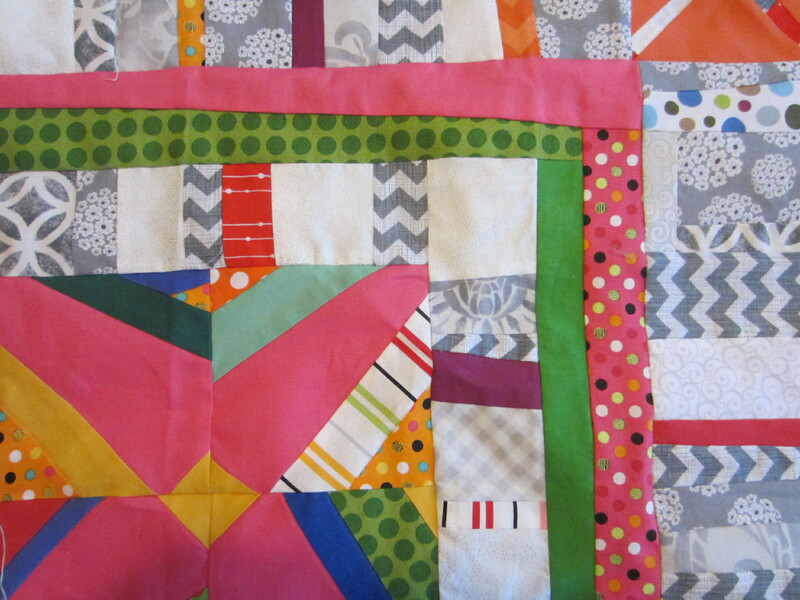 Here is a new setting for strip pieced blocks. Notice how the borders get chopped off in the seams. Just like they do with old quilts. That’s OK too! I really love this one. Sewing fabric strips together is an old, old idea, but this looks like modern art! Even though this one is made from 1890’s reproduction prints, it looks fresh and new. So I had to try it. I cut strips any old shape and size and sewed them back together. You may notice that my fabric color choices are a lot like my painting color choices. I do love pink! No measuring! 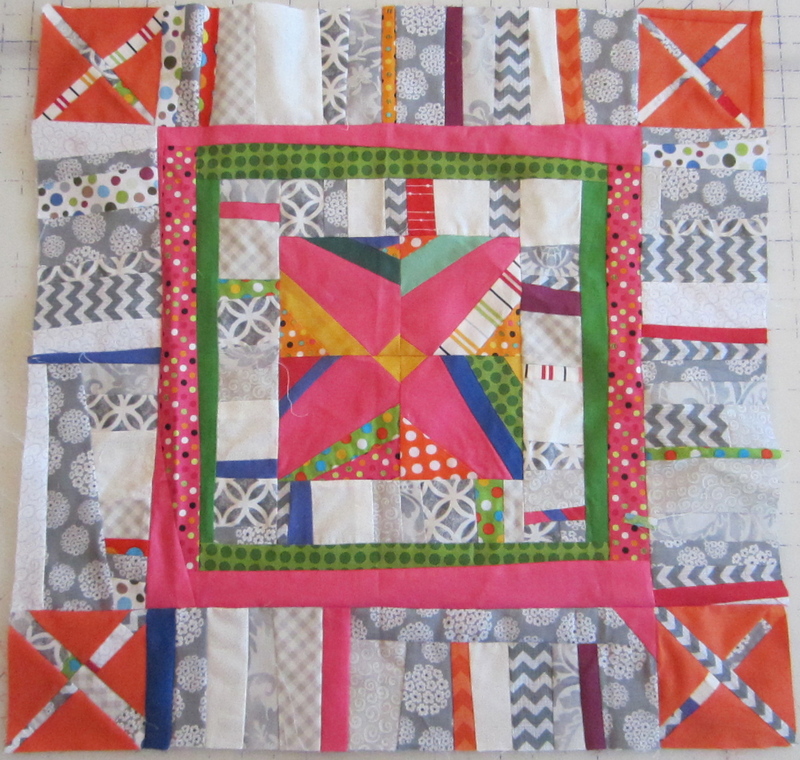 No worrying about points matching or using a perfect quarter inch seam. 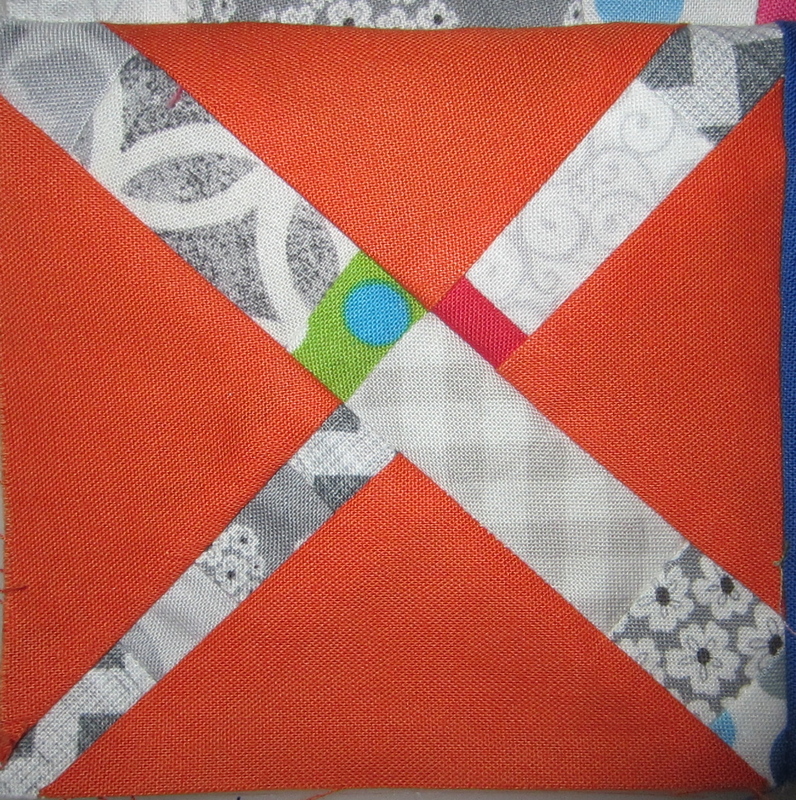 I like this “X” block I made for the corners. This is a 4″ block. Notice the tiny pieced bits in the “X”. Those are all different fabrics I sewed together and then cut into strips. Really not that hard! I worked fast as I could to finish this little piece (about 20″ square) before the day is through. to see how it all turns out. Just don’t expect it to be any time soon! 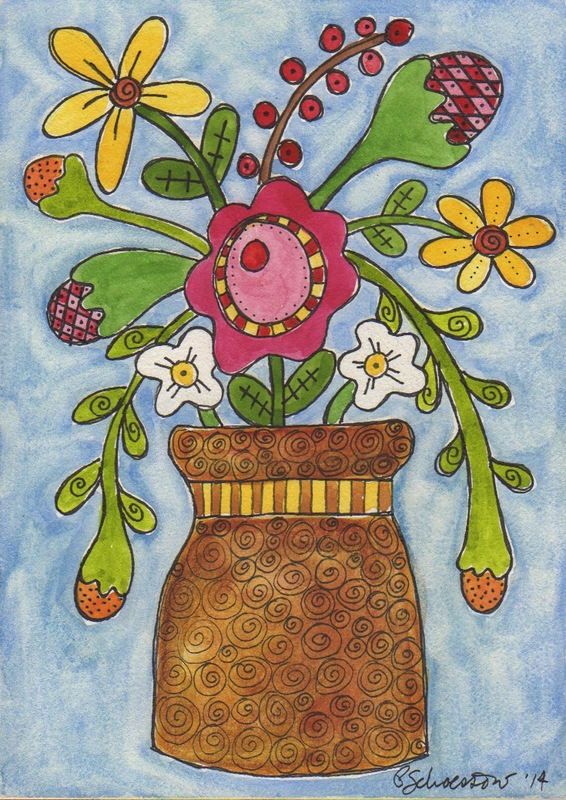 Today’s painting is my whimsical version of a still life pot of flowers. Color makes me happy–specially when it’s so cold and gray outside. Actually, the sun is shining bright through my window right now, and it reminds me that warmer weather and pretty flowers are on their way! 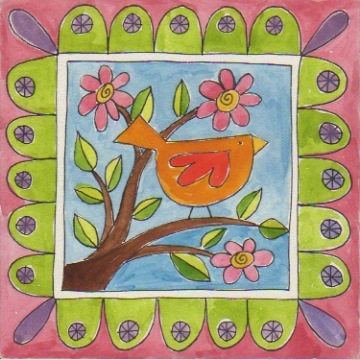 5″ x 7″ watercolor on aqua board with easel See it in my Etsy Shop. So can I still think “Spring” even before Winter arrives? I guess so. Besides, pink makes me happy.